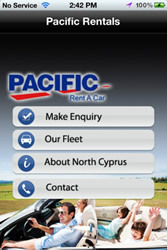 Pacific Rent-a-Car makes booking a car in North Cyprus easier than ever! With our FREE iPhone App you can hire your holiday car within just a few minutes and what's more the application includes a complimentary short North Cyprus guide that will come in useful to anyone visiting the island. As soon as the application icon appears on the screen of your device, tap to access the full opportunities! 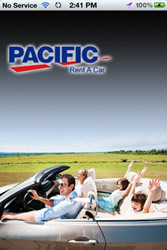 To explore the full variety of cars available from Pacific Rent-a-Car, just go to Our Fleet. You will then be able to make an enquiry regarding booking a particular car through taping on the Enquiry button next to it. Another way to get your quote is through selecting the Make Enquiry menu tab and entering the necessary details concerning your Pick Up and Drop Off as well as choosing the desired car model.Press Next to go through your booking details once again and if you find any mistakes simply go back to make the required amendments. Please provide us with your full name and e-mail address and add comments to the box if you have any requirements or would like to make any further requests. Finally submit your enquiry. You will receive the quote for your North Cyprus car hire from a Pacific representative within one business day.You can then email us with further details to proceed with your booking. If you wish to find out more about weather, border crossings and sights of North Cyprus,tap on the About North Cyprus menu tab. Be interactive, use your iPhone to book a hire car in North Cyprus!